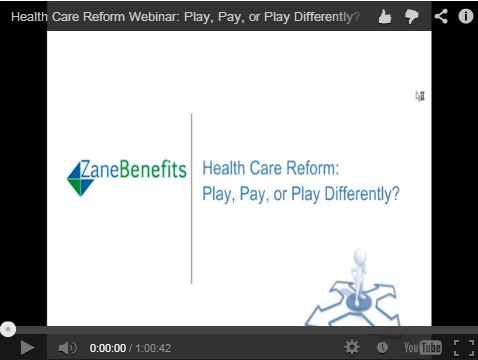 Last week, Zane Benefits' President Rick Lindquist discussed "Health Care Reform: Play, Pay, or Play Differently?" via webcast. The feedback has been outstanding, so we've made a recording available to everyone! Businesses of all sizes are trying to wrap their heads around health care reform and what it means to their bottom line. There are new ways for businesses and employees to save a combined 50% on health insurance through the new individual health insurance marketplaces and individual tax subsidies. Businesses and health insurance professionals should watch this 60-minute webinar to learn how health care reform impacts their business, and how to calculate their health benefits savings.